The series of circulating quarter dollar coins featuring National Parks and sites from across America will enter its second year of release. The 2011 America the Beautiful Quarters feature more striking or iconic designs that have received favorable reactions from collectors. Based on the authorizing legislation for the series, five different designs are to be released each year, presenting a different site from each state, U.S. territory, and the District of Columbia. The order of release is determined based on the dates the sites were first federally designated, which results in a different order than the previous State Quarters Program. In general the designs for each of the five quarters take focus on a single element, which can be viewed as representative of the park. For two of the quarters these are man-made monuments or structures. For two others these are animals, which are well known within the boundaries of the parks. A final design is a unique depiction of a Union ironclad gunboat as it would have appeared during the American Civil War. 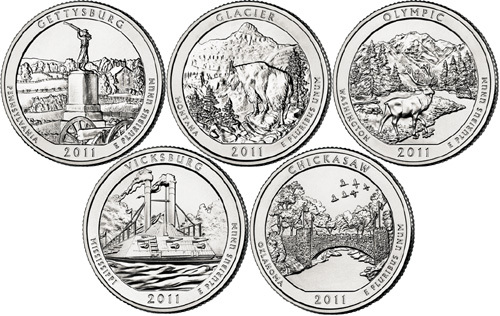 The 2011 America the Beautiful Quarters will be issued for general circulation with a different design released every few months. The coins will also be available through many numismatic products which are offered by the United States Mint, including numismatic bags, rolls, proof sets, and uncirculated coin sets.